I kept on wondering what a utility grade turkey is so I googled and here is what I found out: Turkeys are graded according to quality of appearance. Grade A turkeys are well shaped, meaty, with an even fat covering and all limbs intact. Utility grade turkeys are birds with minor skin tears or one or more parts missing. The missing parts can vary from turkey to turkey. According to Amanda, her mum bought a utility turkey and both legs were missing, as well as the wings. I am sure you must be asking “why those limbs missing” I asked myself the same question. Apparently, there is no quality or taste difference between Canada Grade A or Utility grade turkey. At JD farms the giblets are packed in Grade A turkeys only. Utility grade turkeys have no giblets packed within. Utility grade turkeys are always frozen, according to my experience. I have bought frozen turkey before but I cant remember whether it was a ‘Utility turkey’ or not because all the limbs were intact. Most of my friends are of the opinion that fresh turkey (not ever frozen), has the best taste. Others argue that butterball is the best because it’s brined. I think it’s a matter of personal preference, palate and depth of pocket. 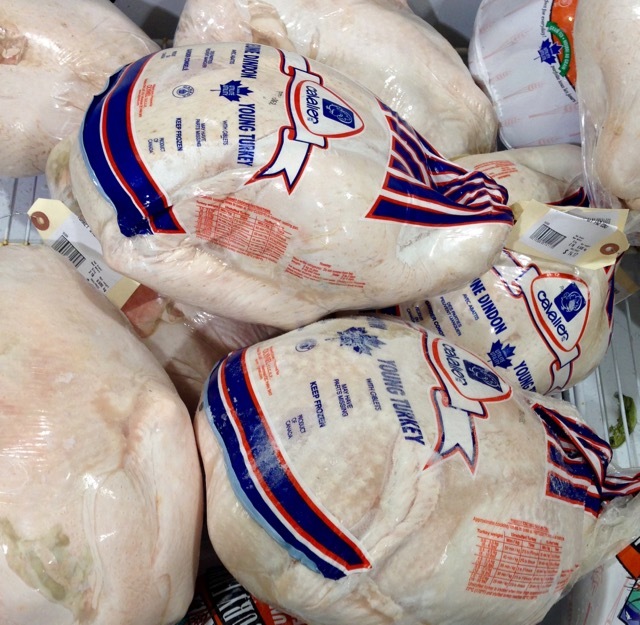 In the last few years, I have been buying fresh turkey, so I can’t remember what the frozen ones used to taste like…. Which turkey do you buy and why? Have a lovely weekend!!!! And to my fellow Canadians I wish you a pleasant Turkey Shopping and a Happy Thanksgiving, ahead. What makes the perfect Thanksgiving turkey? Posted in Glossary, IngredientsTagged 23 Easy Thanksgiving Menus, Grade A Turkey, How to Buy Cook and Carve a Turkey, Utility Turkey, What is a Utility Turkey?, What makes the perfect Thanksgiving turkey? I have a utility turkey in the oven as I speak. They are so much cheaper than Grade eh (😏) turkeys but the taste is as good. They are like the ugly kid in the orphanage that no one wants to adopt but they are just as good. As for Butterball turkey…there’s a reason they are called Butterball, they are injected with a lot of fat, not necessarily butter, to make the meat more moist. I’d never buy them. Thank you for making me laugh. I hope your’s tasted ok. They remind me of the story of the Ugly Duckling. I didn’t know butterball is injected with fat….ugh! I’m never buying them again. ENJOY your turkey. Have a pleasant Easter Weekend! I bought one with one leg missing, and in my mind all I could think was that they were mistreated turkeys and they were broken, and I got kind of worried that they might have some disease,,, never know these days what is going on. I will ccok and eat it, but still!!! Please let me know what it tasted like. I’m sure it will be okay… I get worried too, so I try to buy the fresh ones these day. I hope you enjoy the turkey. Happy Roasting!!! Oh yes of course. The quality is good despite the missing limb. Have a good weekend. Thank you for answering the question that I just asked myself yesterday. Lol. Happy Thanksgiving! Ha ha, I’m so glad I answered you question. I hope you had a happy Thanksgiving! I got one from a farm during Thanksgiving. Interesting…never seen a utility turkey. We buy fresh from a local farmer. Thank you for sharing this information about what a utility turkey is. I never knew either. Me too! pleasant day to you! Honestly, I did not know the difference either, and never bothered to find out because we always bought our turkeys from the local grocer whenever they happened to arrive. As I’ve aged, my digestive system disagrees with me eating turkey, some enzyme I’m told that is in turkey meat. However, turkey was always our traditional “go to” for family celebrations. Thanks for the info Liz, for those of us too lazy to look it up! Happy Thanksgiving to you and your family. I too shall be spending mine with my favourite brother and family! Thanks Sandy. I’m doing a million things at the same time-working, finishing posts, writing new posts, mowing the lawn, cooking dinner etc. I am still able to eat Turkey so we’re are planning one huge one for Thanksgiving. I really look forward to having the whole family together. Best regards to your brother and family. Who knew? I’ve never seen that before. I didn’t know before but now I know!